OLYMPIA—Boating is a popular activity on the Fourth of July holiday and the Department of Licensing doesn’t want an expired boat license to cost you a $257 fine this weekend. All of last year’s boat licenses will be expired on July 1. Boat licenses can be renewed online at dol.wa.gov or at a neighborhood vehicle licensing office. Those who choose to renew in an office should make sure to note the registration number on the bow of the boat or watercraft and take that information to the office. DOL also would like to remind boaters that haven’t yet signed up for email renewal reminders to visit the agency’s website at dol.wa.gov to sign up to receive a reminder next year. Tattoo and body artists and body piercers across the state can begin applying for their industry’s new professional licenses starting this month. The Legislature directed DOL to create a tattoo, body piercing, and body art licensing program in 2009 as a measure to protect public health. The law requires tattoo artists, body piercers, and permanent makeup cosmetic technicians to get and maintain a state license. Business establishments where these services are offered also must obtain a license. 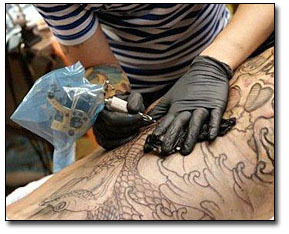 The new regulations and licensing information are posted on the Department of Licensing website at www.dol.wa.gov/business/tattoo. 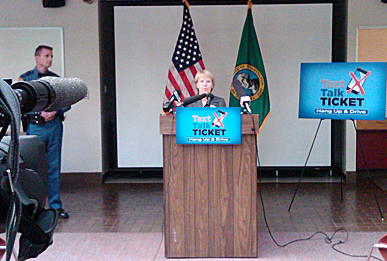 DOL Director Liz Luce speaks at a news conference June 10 on the new cell phone law. DOL Director Liz Luce and State Patrol Capt. Chris Gundermann talked with reporters in Vancouver, Wash. on June 7 about the dangers of distracted driving and the new law that will give police statewide the ability to ticket drivers using mobile devices illegally as a primary offense starting June 10. Luce focused on young drivers with intermediate licenses. They’re prohibited from using a cell phone, with or without a hands-free device, except they are reporting an emergency to 911. “Being late for a date is not an emergency,” Luce said. She went on to say that many parents give their young teens cell phones to help keep them safe, but a phone becomes one of the most dangerous things they can have when they’re behind the wheel, and told the story of 19-year old Heather Lerch, who lost her life in a collision south of Olympia in February. Lerch was texting-while-driving. Come June 10, drivers with regular licenses are prohibited from using a cell phone without a hands-free device. You can read more about the event in The Columbian. Or another story in the Everett Herald. You are currently browsing the Licensing Express blog archives for June, 2010.